Well, I’ve been gone for a minute. Thanks for being patient with me; I’ve been writing, completing my journey in graduate school, and getting ready to transform into what I’ve dreamed about for some time. I’m so happy about sharing my opinion with the world about blackness, pop-culture, literature, and life again!!! So much has happened in the past two months: The death of Nelson Mandela, and a Fake Interpreter emerges in to pop-culture history, the Healthcare.gov website finally started working properly, Q-Tip & Busta Rhymes dropped a FREE mix-tape, Beyonce debuted her 5th album and Scandal’s last episode was off the radar. And, I hope you had a chance to catch Conan O’Brien’s skit with Ice Cube & Kevin Hart. If not, you have to check it out via Youtube. s/o to Jameis Winston for winning the Heisman Trophy! I still got love for Jhonny-Football too. I live in Texas, it was only proper that I put that snippet in there. Yes, it’s been very LIVE and it’s only going to more interesting in 2014. To end the year on a positive note, I’ve produced a new magazine: A F R O C H I C K M A G A Z I N E! 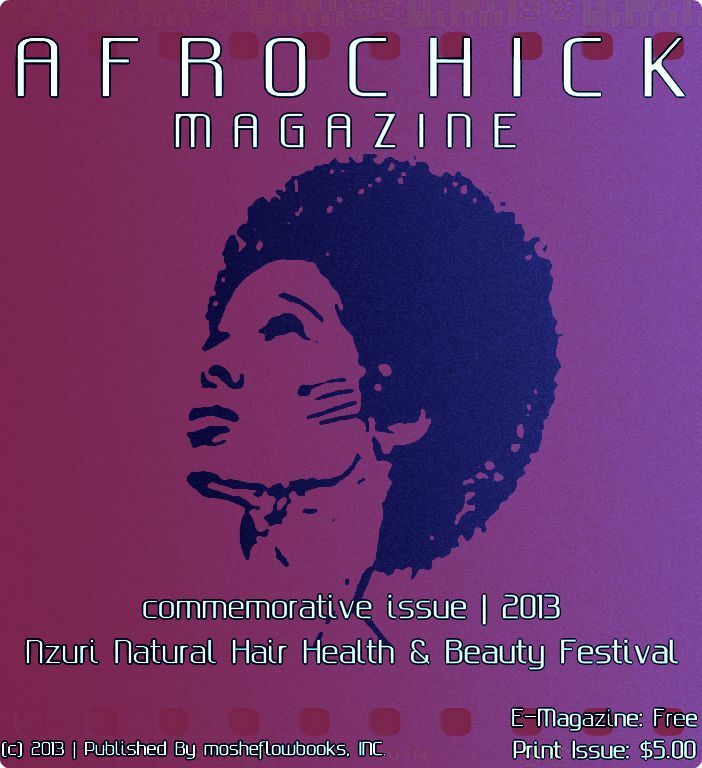 The magazine was created to commemorate my experience as a blogger for the 2013 Nzuri Natural Hair Health & Beauty Festival – held at Reliant Center in Houston, Texas. This issue features some hot stories about different individuals that were a part of the natural hair extravaganza, poetry, book reviews, natural hair care tips, freebies and so much more! I had a lot of fun participating this year and want to share it with the world. In the meantime: HOLLA BLACK!